At UN, As Syria Lambasts Ban, Talk of Russian Answer But No Speech, Egypt PR Has Conflict of Interest? UNITED NATIONS, March 2 -- Before the Syria speech of UN Secretary General Ban Ki-moon on Friday, in front of the General Assembly Hall Inner City Press asked entering Ambassadors for their predictions long and short term. Many spoke of a Security Council resolution "floating" off the radar, on which "the Americans are waiting to hear back from the Russians after the weekend," an insider told Inner City Press, referring to not only to the Russian elections but also to a National Security Council meeting there. Others filled in blanks for Inner City Press in Kofi Annan's schedule, beyond the bilaterals with Iran, the UK and China that Inner City Press staked out and filmed. Annan had lunch with three Arab Permanent Representatives -- Morocco, Saudi Arabia and job-seeking Egypt -- and the "Qatari charge d'affaires." UN Peacekeeping chief Ladsous "sat in but said nothing," an attendee said. When the GA speeches began the European Union, it turned out, did not speak, arguing that "it's good that the Arabs be heard." Saudi Arabia had inscribed itself earlier in the day, Egypt at the last minute. Finally Iran's Ambassador arrived. He commented to Inner City Press on the previous day's article about his meeting with new envoy Kofi Annan, then went in and signed up to speak. His main point, he said, was that for Annan to have a change, provocative statements have to stop. After Ban read out his speech, Syrian Ambassador Bashar Ja'afari delivered a lengthy rebuttal lambasting Ban. He began by professing friendship and respect for Ban, but quickly called him and his speech blurry, slanderous and "virulent." Ban sat there, with a pinched look on his face; his spokesman Martin Nesirky periodically came to the stakeout, where other than Inner City Press there was practically no media. Later a TV crew from Benin arrived and interviewed Ja'afari, in French. Saudi Arabia's Permanent Representative said that history will judge those who case vetoes for Syria in the Security Council. On his way in, Russia's Permanent Representative Vitaly Churkin had told Inner City Press he had a strong speech ready, if needed. If so, he did not use it. As he left, Inner City Press asked him about the Saudi statement that history would judge him. "History will judge everyone," Churkin replied and left. China's Deputy Permanent Representative had the same response, but said it was not coordinated. Egypt's Permanent Representative Maged Abdelaziz made a point that Syria had not objected to moves against Libya in the League of Arab States. Inner City Press asked him about it afterward, calling it interesting. "I hope you use it," he replied. But Ja'afari of Syria told Inner City Press it wasn't true, that Syria had "made reservations" on a no-fly zone over Libya. He noted, as the Press has before, that Maged Abdelaziz is asking for a job from Ban's UN Secretariat. Some would call it a conflict of interest. Saudi Arabia invoked Rwanda, Srebrenica, Kosovo and Gaza. Ja'afari replied that it was insulting to compare Rwanda to "Baba Amr, a neighborhood we love." He took invoked Gaza. Palestinian Observer Mansour was present but did not sign up to speak. 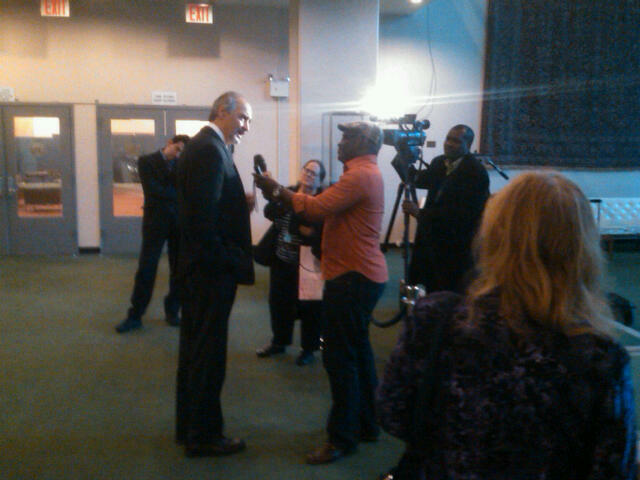 Afterward several Permanent Representatives marveled to Inner City Press that Ja'afari had gone so hard on Ban. One surmised it is because Kofi Annan is viewed as more of a mediator, and as "a larger figure," as a Permanent Representative put it. Ban will be cast as the "puppet of the West, reading speeches written by them." One comparison inevitable at least from here: if Ban Ki-moon is so concerned about human rights and war crimes, why has he said nothing about having on his Senior Advisory Group on Peacekeeping Operations the Sri Lankan General Shavendra Silva, whose 58th Division is depicted in Ban's own Panel of Experts report as engaged in war crimes? Watch this site.